In recent days, Rob Young has been uploading some of his "runs" to Strava. He spent most of Friday June 24 slowly trickling out a string of uploads, admitting that he apparently has to inspect each one before making it "unprivate". LetsRun forum members have documented instances of uploaded-then-deleted activities, unrealistic paces, likely areas of RV-riding to running transition, etc. 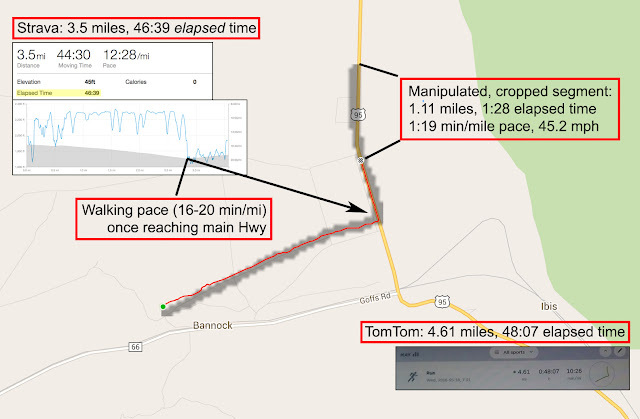 The Strava activities, of course, do not contain any cadence data that would have been recorded by the model of TomTom GPS watch Rob uses, and preserved on the TomTom MySports website. Instead, carefully curated, stripped-down data is being presented on Strava. Around 700 miles out of his 2100 mile journey are currently missing from the site - including the time of the Asher Delmott incident and of the Bannock to Laughlin "run". The Strava data is also being manipulated. Here I will focus on the run from the broken down RV discussed in the other post on this site to illustrate this general point, and to bolster the evidence of cheating on this particular day. As we previously established, Rob's RV broke down in Bannock, CA on May 18 around 6-6:30 in the morning. Around 7:30, he proceeded on foot to Hwy 95. At this point, given the photographic evidence of his presence in Laughlin 34 miles away no later than 12:52PM, and obscured TomTom data, we were able to conclude with relatively high certainty that Rob must have ridden in a vehicle for the ~13 miles up Hwy 95. Once again, we can see that the TomTom website is displaying elapsed time. It's just important we compare the same thing, but elapsed time is probably even better as we can know the actual time of day if necessary. Anyway, let's get down to business knowing we can do an equitable comparison. Yes, that's right... 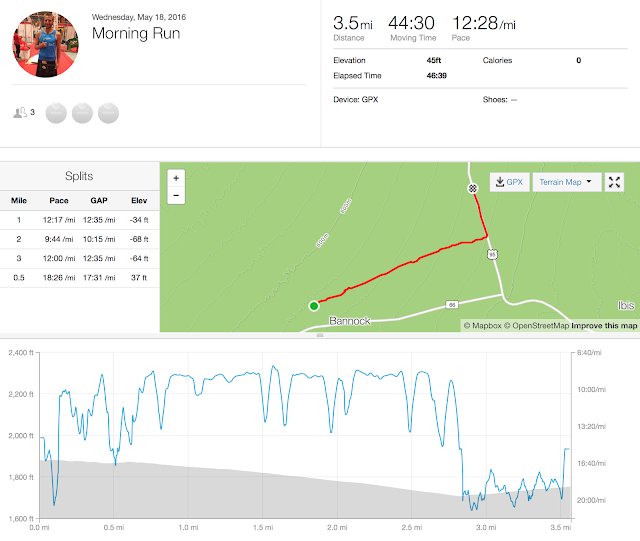 The Strava upload has been cropped, and the missing portion was a little over 1 mile done in a minute and a half. Rob may be something else, but I'm pretty sure he's not running 45 miles per hour. The implication is obvious. The Strava activity shows that Rob ran along the dirt road leaving the RV at about a 10 min/mi pace, then began walking at 16-20 min/mi once he reached the main highway. Are we to believe that he somehow turned on the jets immediately after these mediocre paces, running 35 miles through the desert with NO support and minimal fluids, at a sub-7 minute pace? No sir. He walked about 3/4 of a mile north, while looking for his ride, or perhaps being ultimately offered a lift. He entered the vehicle and only remembered to stop his watch a mile down the road. A 1:20 mile pace would not pass the sniff-test, so he had to crop it off. We're still waiting for any other runs from May 18 after this one to be uploaded, but something tells me those aren't coming. Rob Young began his hitchhike about a mile before previously thought and had to crop off a recorded activity to hide it.